Paros may not be one of the best known of the Cyclades but this is precisely its appeal. 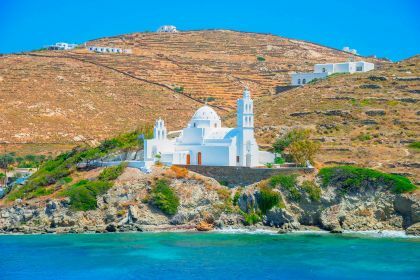 This idyllic island in the central Aegean is known for its laid-back, understated charm, breathtaking vistas and authentic Greek island experience. 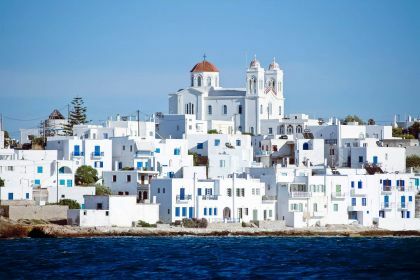 The weather is consistently mild, traditional whitewashed houses dot its hills… and you can dolphin spot as your yacht approaches the island through the shimmering azure waters of the Aegean. Paros offers you the perfect sailing destination if you’re looking for a somewhat off-the-beaten-track experience. 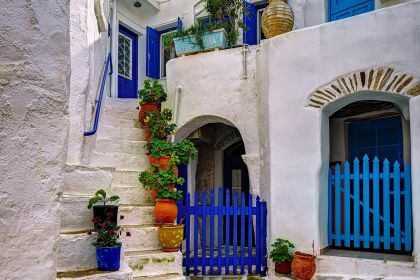 Moor your yacht in the colourful harbour at Parikia, Paros’s commercial and tourist centre, and start exploring this fascinating capital, with its iconic blue and white houses and picturesque cobblestones. You’ll love strolling its streets, bustling with shops and lively restaurants, treading its winding paths and narrow alleyways. 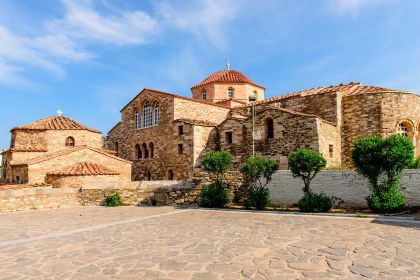 Make sure the ancient Panayia Ekatondapiliani Cathedral (Church of 100 Doors), which dates back to the Byzantine Empire, tops your itinerary. Admire its impressive stonework, stunningly preserved frescoes and scenic lemon trees in the courtyard – you’ll appreciate its tranquil surroundings while learning about this facinating historic period. Feast your eyes, too, on some rare icons, jewellery and relics. The Archaeological Museum in Parikia is also well worth your time. Displays include findings from excavations on the island, mostly from the sanctuaries of Apollo and Asklepios. Close your eyes and feel yourself time travel back to an ancient era. 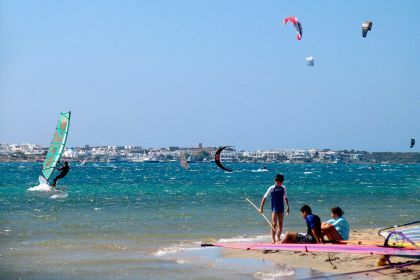 While Parikia offers myriad reasons to visit, however, there is so much to Paros than just the capital. The less touristy villages of Piso Livadi (a scenic coastal settlement 18km away) and Lefkes (a verdant, mountainous village), for instance, lure travellers with their charms. Think cosy tavernas, hospitable locals, and scenic vistas that are tough to beat. Naoussa, considered the centre of cosmopolitan life of the island, is a magnet for serious foodies, so be sure to sample some of its wares. If you’re looking for a sophisticated dining experience, head to the famed restaurant Barbarossa, which has been serving ouzo and fresh seafood on the same spot since 1963. Clientele over the years has included Tom Hanks, Giorgio Armani and Domenico Dolce and Stefano Gabbana, of Dolce and Gabbana fame. Other recommended fine-dining options include Le Sud in Naoussa and Levantis in Parikia. Paros is undoubtedly a paradise for divers, and there is no shortage of inspiring adventures awaiting you. Prepare to be wowed by the underwater offerings. With up to 40m visibility in the vicinity, it is sure to thrill divers, veteran and inexperienced alike. Dive into crystal clear waters and enjoy the awe-inspiring scenery of drop-offs, caverns, boulders and channels. You’ll soon be booking your return trip. Insider tip Kolymbithres Beach, with its fascinating lunar-like rock formations, is a picturesque spot to climb rocks and take pictures. The area is characterised by tiny coves, hence the name Kolymbithres (or swimming pools). Visit at sunset when every photograph is guaranteed to be an artwork.